Born 1930 in Falenty near Warsaw, she lived and worked in Warsaw. One of Poland's most internationally-acclaimed artists, Abakanowicz is known for works that transcend the conventional sphere of sculpture production. She passed away on 20th April 2017. 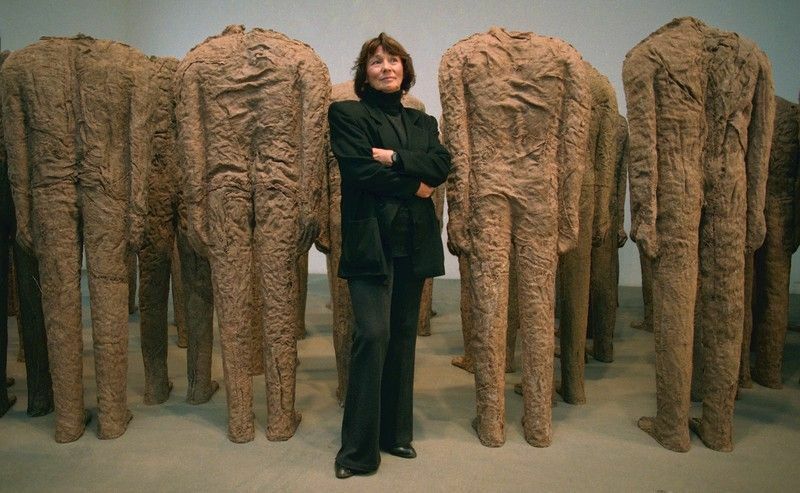 Magdalena Abakanowicz with her piece Crowd. Photo: courtesy of CSW. Sculptor, one of Poland's most internationally-acclaimed artists. Abakanowicz studied at the Warsaw Academy of Fine Arts between 1950-1954. For a time she tried her hand at painting, producing monumental gouache compositions on cardboard and canvas. Her first major independent achievement was based on using three-dimensional textiles as a medium. Abakanowicz became intimately associated with soft sculptures known as 'Abakans'. Abanowicz being interested by the texture of matter, particularly the organic nature of her medium of choice. Abakans - made from dyed sisal fibre - with its multiplied organic nature - was shocking. At exhibitions they were suspended from the ceiling, unidentifiable monsters wrapped in canvas cloth. In spite of their unnerving connotations, Abakans inspired admiration for the artist's ingenuity and consistency, soon becoming Abakanowicz's ticket to international salons. These novel figures delighted viewers and critics at the 1964 International Biennial of Tapestry in Lausanne and earned the gold medal at the 1967 Sao Paulo Biennial, launching international renown for the artist. Abakans reflected Abakanowicz's sculptor-like approach to fabric and to the technical possibilities of manipulating the medium. She took advantage of its softness, pliancy, and submissiveness. However, the huge, circular sheets take on an animalistic form under the artist's touch. Abakans look dangerous, their hides resembling stripped off giant monsters, an effect enhanced by the artist's use of a superhuman scale for these mysterious beings. Abakanowicz has remained faithful to the law of the series, preferring sets to individual works. The law, applied in Abakans, was even more manifest in her 1970s exhibition Organic Structures. After many years soft things of complicated tissue have become my material. I feel a kinship with the world which I do not want to know but through touching, feeling and relating to the part of myself which I carry deep inside me. (...) There is no tool between me and the material I use. I choose it with my hands. I shape it with my hands. My hands transmit my energy to it. By translating an idea into a shape, they will always pass on something escaping conceptualisation. They will reveal the unconscious. 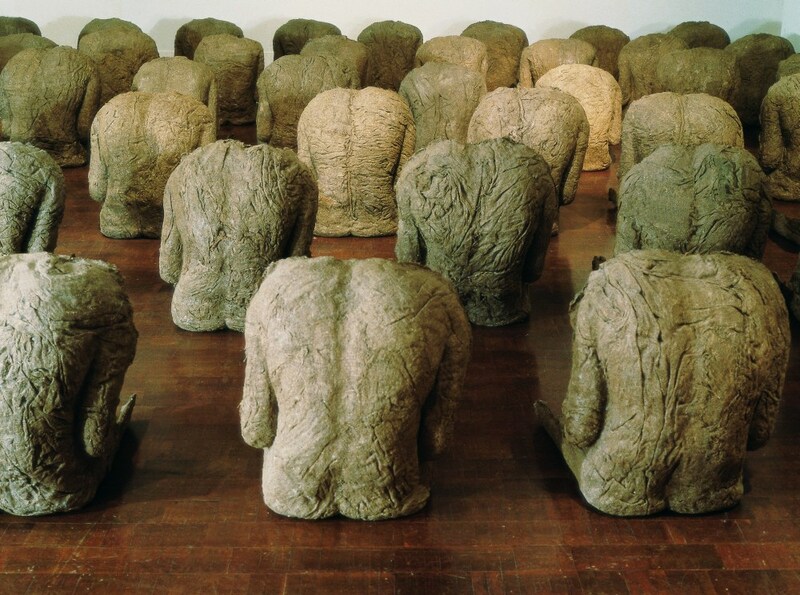 Abakanowicz's later series tended likewise to be made from pieces of coarse sackcloth which she sewed and pieced together, bonding it with synthetic resin. This is how she made Alterations (1974-5) - twelve hollowed-out human figures sitting in a row; Heads (1973-5) - a series of enormous, solid forms remindful of human heads without faces; Backs (1976-80) - eighty slightly differing negatives of the human trunk; The Crowd I (1986-7) - fifty standing figures; Ragazzi (1990) - forty 'skins' stripped off young boys; and Infantes (1992), 30 Backward seated Figures (1993-4), 7 Dancing Figures (2001-2). The basic reference of Abakanowicz’s works has been man, his condition and position in modern world, and most of all his confusion by the excess and anonymity in the crowd. This is reflected in her sculptures of the 1980s and 1990s, in which she used new materials: metal (mostly bronze, such as in the series Bronze Crowd, 1990-91 Puellae, 1992), wood, stone, and sometimes clay. Her art of that time returned for a while to the idea of 'organic structure', as evidenced by Embriology - the environment made at the Vienna Biennial in 1980, made of several dozen soft, egg-like lumps of various sizes dispersed round the exhibition room. In Katharsis(1986) she used even more simplified forms, while retaining her interest in the figure. This open-air realization for the Guliano Gori Foundation in Florence showed a group of thirty-three de-humanized, three-metre-tall human torsos cast in bronze. Abakanowicz showed a man of lost identity, an androgenic everyman, emphasizing the commonness of human fate and the painful burden of corporality. She showed a dead reflection of the real shape deprived of the matter, the flesh, the essence. She was interested in - to use her own words - "man's horrible powerlessness against his biological structure". When examining man, I am in fact examining myself... My forms are the skins I strip off myself one by one, marking the milestones along my road. Each time they belong so much to me and I belong to them so that we cannot exist without one another. Soft, they contain an infinite number of possible shapes of which only one can be selected by myself as the right, meaningful one. I create space for them in exhibition rooms where they radiate the energy I have given them. They exist with me, they depend on me, I depend on them … Without me they make no sense, like discarded body parts separated from the torso. This self-commentary seems to refer also to Abakanowicz's previous artistic pursuits, the Abakans - even though they may not look like works rooted in specific personal experience or emotions and are far removed from the total, crowdy anonymity of Heads or Backs. Perhaps it is so because "Abakans" retain the unique character of the fabric and their strong colours disregard the natural colour of the material - there is a Red Abakan (1967); Brown Abakan (1969-72); Orange Clothes (1969); Black Environment (1970-78);Black Clothes with Sacks (1971). Abakanowicz’s later works lose their individuality in a double way: through the artist multiplying one shape and through her adopting one, monochromatic colour scheme, defined by the properties of the material. 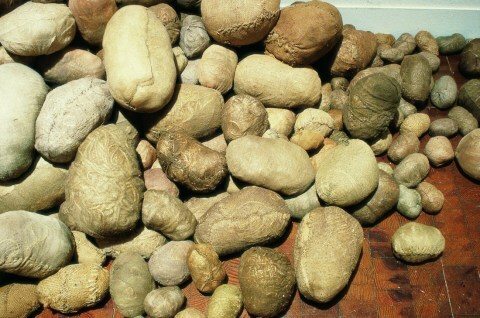 Abakanowicz has followed this approach in most of her artistic endeavours. This title is atypical of my work. Other names are either strictly descriptive, like Backs or Seated Figures, or very distant, metaphorical, like Embriology, which refers to science and not to a set of objects sewn from sackcloth. If that series had a different name, it may have evoked totally different association. One of the artist's most interesting works, War Games seem ambivalent. On one hand, they emanate negative, "military" energy, are huge and dominant; on the other, they are helpless stumps. They may be regarded as a statement whose metaphorical message applies not only to "human condition" understood as entanglement in existential problems, but also to ways in which man takes part in History and Art. The artist herself has pointed to the possibility of putting some of her works in a specific historical perspective. Asked by Zbigniew Taranienko: "Has it been noticed in Poland that, while ambiguous, your works have political overtones? ", Abakanowicz answered: "It was not noticed even during martial law, when in 1981 I exhibited The Cage at the Catholic University of Lublin, nor during the 1987 exhibition of Anonymous Portraits, which used plinths that looked like the support of a guillotine". I was very young. I crouched down over a boggy pond to watch tadpoles. … I could distinctly see tangles of guts through the thin membranes which covered their distended bellies. … Brought with a stick to the shore, touched roughly, their distended bellies would burst, their knotty, disorderly contents flowing out. … I was sitting, my heart pounding, shocked by what has happened, by the destruction of the soft life and the infinite mystery of the soft contents. … Years later things which were soft, with a complex tissue, became my material. Initially, however, the explanations she provided for her works did not include such direct references. It was as if she had taken care to hide certain meanings, intent on defending the inner homogeneity of her artwork. Asked by viewers and critics whether Backs was a reference to "Auschwitz or a religious ceremony in Peru or Ramayana's dance? ", she would reply that all those answers were legitimate, for the man that interested her was "not the man of a certain time, he is the man as such", and that her art was simply a universal "tale of human condition". She ultimately stated: "I keep working on the same old story, one as old as existence itself, I keep talking about it, about the fears, disappointments and longings that it brings along". A number of Abakanowicz's projects, particularly the monumental ones, were displayed in open spaces, the vast majority outside of Poland. She refers to them as 'spatial experiences' which can also be considered 'spaces of emotions'. Such projects have included: Sarkophagi in Glass Houses (France 1983-89), Negev (Israel 1987 - seven stone circles), Space of Dragon (South Korea 1988 - ten metaphorical bronze animal heads), The Frozen (Japan 1993 - forty bronze figures), Hand-like Trees (USA 1993 - five metaphorical bronze trees), Space of Unknown Growth (Lithuania 1997-98 - twenty-two concrete forms), Walking Figures (USA 1999 – twenty bronze figures), Birds - Knowledge of good and evil (USA 2001 - six bird-alike aluminium figures), Space of Stone (USA 2002 - twenty-two granite boulders). 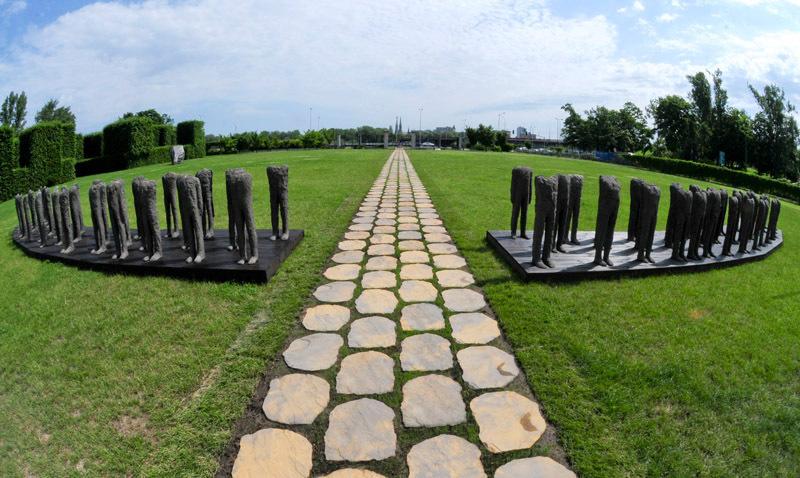 The largest of such installations - a group of a hundred and twelve cast iron figures entitled Unrecognised (2002) - is in Poland, inside Poznań's na Cytadela Park. 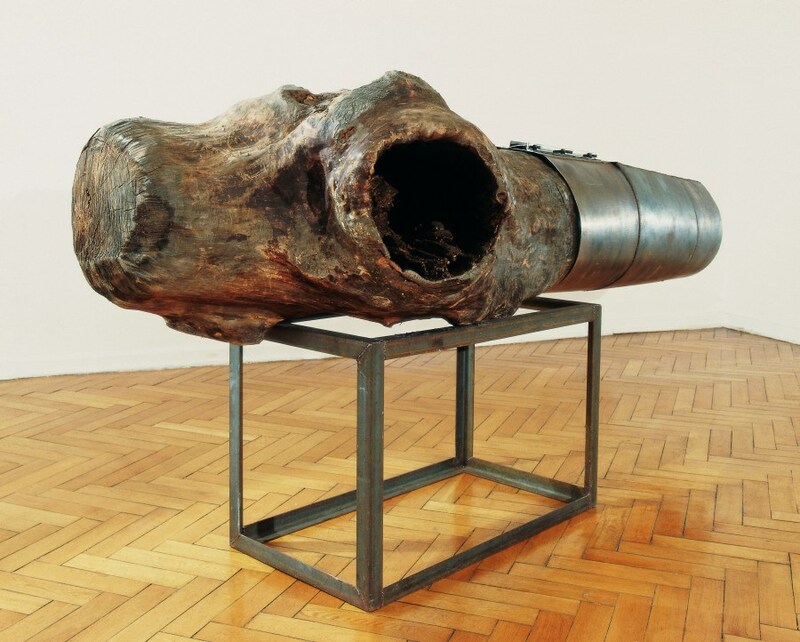 Another Polish town, Elbląg, is home to the first-ever artifact permanently placed in a non-gallery environment, the tree-like steel form which Abakanowicz created during the 1st Biennial of spatial Forms in 1965. In 1991 Abakanowicz received a commission from Paris city authorities to develop the western side of La Defence. The result - a bold conception of 'arboreal architecture' - was, however, never implemented. Another architectural project of hers was The Hand (1994), a design of a 'tower sculpture' commissioned by Hiroshima town authorities to commemorate victims of the nuclear bomb. Like with La Defense, the artist intended the walls of her construction to be, over time, overgrown with plants. The design, alas, was not implemented. In 2006, Chicago authorities commissioned Agora - 106 iron cast figures, each about 9 feet tall, depicting a figure from the waist-down, frozen in mid-step. They're displayed at Chicago Grant Park. In 2010, the city of Warsaw commissioned the artist's first open-air project - the legendary knights Wizard, Percival, Lancelot and Galahad were recreated as abstract steel figures, each weighing some 400 kg, are a permanent exposition in Warsaw's Romuald Traugutt Park. likely to keep giving up some techniques and materials in favour of others, without losing, however, the core message. The most interesting thing is to use techniques you are not familiar with and build forms you do not know. The diversity of Abakanowicz's work testifies to her unflagging inventiveness and to her skill in practicing her creed: "I do not like rules and regulations. They are enemies of imagination". Abakanowicz has for years been among the group of artists represented by the Marlborough Gallery. In 1965-90 she taught at the State School of Fine Arts (nowadays the Academy of Fine Arts) in Poznań. She has also been a guest lecturer in Los Angeles, Berkeley, Boston, New York, San Diego, Sydney and Tokyo. Her numerous awards include the Grand Prix of the 8th Biennial of Tapestry Art in São Paulo (1965), Gottfried von Herder Prize, Vienna (1979), The Alfred Jurzykowski Foundation Award, New York (1982), Sculpture Centre, New York (1993), Leonardo da Vinci, Mexico (1997), Visionaries l, American Craft Museum, New York (2000); distinctions: Commodore's Cross with Star of the Order of Polonia Restituta (1998), Officier de L'Ordre des Arts et des Lettres, Paris, France (1999), Cavaliere nell Ordine Al Merito della Repubblica Italiana (2000); honorary doctorates: Royal College of Art, London (1974), Rhode Island School of Design, Providence (USA, 1992), Academy of Fine Arts, Lódź (1997), Pratt Institute, New York (2000), Massachusetts College of Art, Boston (2001), School of the Art Institute, Chicago (2002), Academy of Fine Arts, Poznań (2002). She is also a member of the Akademie der Kunste in Berlin (since 1994), American Academy of Arts and Letters (since 1996), Sachsische Akademie der Kunste in Dresden (since 1998), Orden Pour le merite für Wissenschaften und Kunste in Berlin (since 2000). Abakanowicz's works have been part of dozens of exhibitions around the world - the artist having personally prepared each one - at the Ludwig Museum in Cologne, Hiroshima City Museum, Museum Sonje in Kyongju (Korea), Museo Nacional Centro de Arte Reina Sofia in Madrid, National Museum in Wroclaw, Musée d'Art Moderne w Paris, Metropolitan Museum of Art in New York, National Gallery of Art in Washington, Marlborough Gallery in New York, Centre for Contemporary Art and Zacheta National Gallery of Art in Warsaw. She also participated in major international art reviews, notably in Lausanne (from 1962 to 1976 and in 1985), Venice (1968, 1980, 1995), São Paulo (1965), Antwerp (International Open Air Sculpture Biennial, 1983), Sydney (1986). Her works are in many of the above museums and galleries. In Poland the largest collection of her art is in the collection of the National Museum in Wrocław. 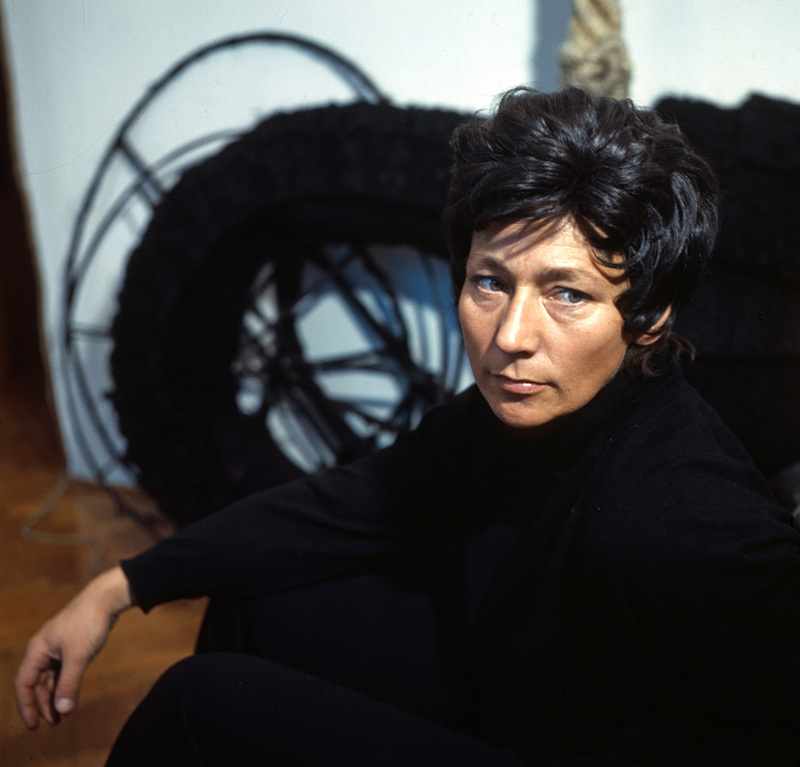 Magdalena Abakanowicz held Honourary Doctorates from many international institutions of higher learning, including the Royal College of Art, London, England (1974), Rhode Island School of Design, Providence, Rhode Island (1992), Academy of Fine Arts, Łódź, Poland (1998), Pratt Institute, New York (2000), Massachusetts College of Art, Boston, Massachusetts (2001), Academy of Fine Arts in Poznań, Poland (2002), School of the Art Institute of Chicago, Chicago, Illinois (2002). She passed away aged 86 on 21st April 2017. Author: Malgorzata Kitowska-Lysiak, Art History Institute of the Catholic University of Lublin, 2004. Updated by Agnieszka Le Nart, January 2011.